This tree in Colorado Austrian pine has become a favorite ornamental pine. 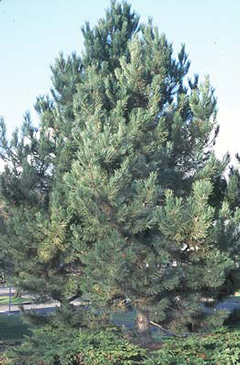 It is widely planted in our community landscapes and is almost as popular as the Colorado blue spruce. It adapts well to many types of soil conditions although it will not tolerate extremely wet or soggy soils, a condition that all pines and most conifers dislike. Austrian pine has a much fuller crown than its Colorado native, ponderosa pine. For that reason, it is planted as a “screen” to hide views or block wind. 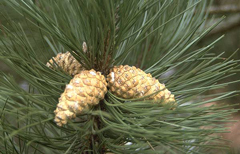 Its needle color is darker green and they are slightly smaller and stiffer than ponderosa pine. Hardiness Zones 3B to 7. Can survive up to Zone 8 but seldom seen. It prefers the colder climates. Growth habit Pyramidal and full looking when young with lower branches maintained. Older tree becomes flat-topped and more open. Can reach 60′ in height. In good conditions, grows 12-18″ per year. Foliage In pairs, persisting about 4 years. Stiff and densely placed on branchlets. Needles are 3 to 6 inches long. Can be straight or curved. They are minutely toothed and the apex is pointy. Twigs and buds Orange-brown, glabrous, scaly or rough. Buds are silvery and striped, 1/2″ to 3/4″ long. Silver buds are another distinguishing characteristic from the brown buds of ponderosa pine. Cones Cones are solitary or in clusters. Ovoid and conical, 2-3″ long. Cone scales are not pointed, a distinguishing characteristic from ponderosa pine’s “armed” scales. Bark Light gray with dark brown furrows when younger. Rough. 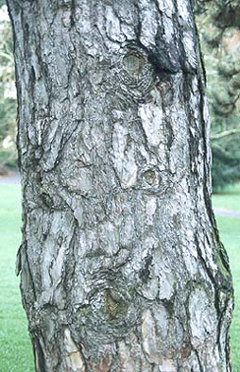 Mature trees have large plates of bark with a mottled silver gray appearance and deep furrows. Insects and diseases Fairly insect and disease free. When young, pine tip moth can damage the terminal buds on upper branches causing deformation and co-dominate leaders. Ips beetle can also attack if tree is stressed. Landscape value Highly valued and widely planted. Lower branches remain on main stem for a long period providing good wind and visual protection. It should be given ample space to grow. Provide at least 8′ for lower branches to spread. Can be planted in groups or individually. Mature trees have a stately appearance with its silver-gray bark and flat-topped look.